Thomas Lincoln, the husbandman, had eleven children. Of those, three were sons that lived to adulthood and had children: Joshua, Caleb, and Thomas. Joshua and Caleb were twins, born on the same day (03-May-1645), and numerous descendants for each are known. So far, not much is known of the descendants of Thomas, the third son to have children. Thomas had the same birthday as his father (22-Dec) and was seven years younger than Joshua and Caleb. The "Genealogies" section of this web site provides brief biographical information on each known descendant of Thomas Lincoln, the husbandman, and the sources of the information are also provided. Maps of the places where the individuals lived are also provided. Click on any of the maps or sources to display an enlarged, readable image. The individual's paternal history and children are listed, and may be directly accessed by clicking on their name. To go directly to a descendant, click on the "Name Search" title above, and then click on the person's name. Or, you may start with Thomas Lincoln, the husbandman, by clicking on his link below, and then browse through his descendants by clicking on the name of a child. Children whose names appear in bold letters will have a separate page of information. If a child's name is not shown with bold letters, then no additional information has been entered for that individual. 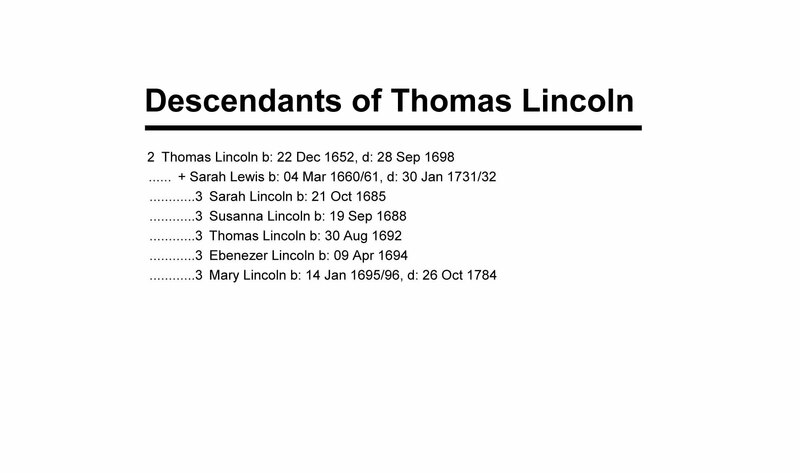 The summary charts shown below display the descendants of Thomas Lincoln, the husbandman, subdivided by his three sons that lived to adulthood and had children. Click on a chart to display a magnified view. The number next to a person's name refers to the generation number from Thomas Lincoln, the husbandman. For example, the "2" to the left of Joshua's name indicates he is a second generation descendant (which is actually a son). The mothers of descendants are also shown. If a descendant had another wife, but had no children with that wife, then that wife is not shown. She is displayed in the "Genealogies" section, however. This web site is continuously updated. Names in the charts have been researched, but some names may not yet be discussed in detail in the Genealogies section. The charts were generated using Family Tree Maker 2011 and Photoshop Elements.